Vital Rotherham United’s Man of the Month for August is Semi Ajayi. The tall defender, who has played in a few positions in the opening month of the season, was voted Vital Rotherham’s Man of the Match in three games during August – in our home wins against Ipswich Town and Millwall and the Cup game away at Everton. 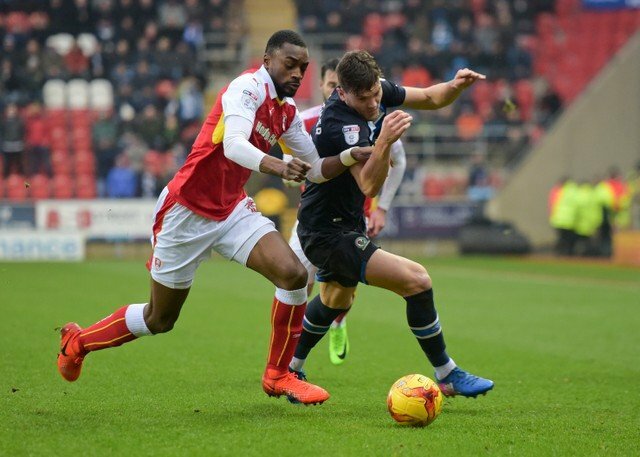 January 2017 saw Semi arrive at the New York Stadium, originally on a loan deal, from Cardiff City and his calmness soon had the Millers fans on his side. He soon became a first team regular and agreed a permanent deal in March 2017 completing it in the summer. Semi is now with the Nigeria team in the Seychelles (very nice!) and is hoping to get his first full international cap today when they take on the Seychelles in a African Cup of Nations qualifier and said he was ‘delighted’ with the call-up. He has previously played for the U20’s side. Our first game of the season away at Brentford, which most of us want to forget, saw Kyle Vassell, who actually only came off the bench for the last fifteen minutes or so, get the accolade. Striker Jamie Proctor played his first game for around a year when Wigan Athletic were in town for the Carabao Cup first round game. He scored twice and was voted our Man of the Match while goalkeeper Marek Rodak got the vote for our away game at Elland Road against Leeds United. When the Millers played host to Hull City midfielder Ryan Manning, who is on loan from Queens Park Rangers, was voted Man of the Match. Things are a little different with the voting for the Man of the Match. It is now on the front page of Vital Rotherham and you give a score out of ten to each player. Well Done Semi! and well deserved.